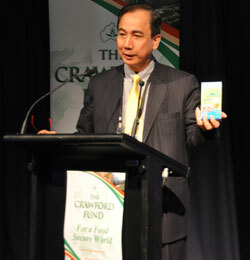 Dr William Dar, Director General, ICRISAT, discussing the food versus energy challenge at the annual Crawford Fund food security conference. 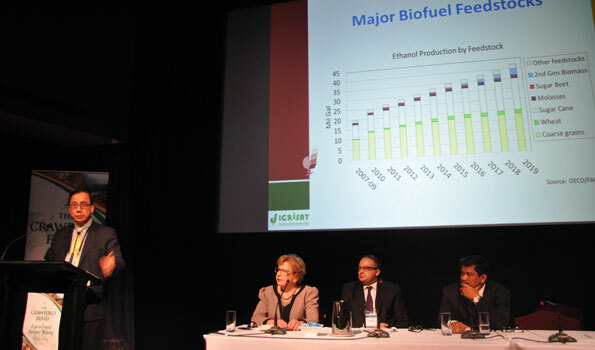 Canberra, Australia (27 August 2014) – “We can link the poor and marginal farmers with the global biofuels revolution without compromising their access to food and nutrition,” said Dr William Dar, Director General of the International Crops Research Institute for the Semi-Arid Tropics (ICRISAT). Tackling the complexity of the food versus energy challenge, Dr Dar spoke at the annual Crawford Fund food security conference held in Canberra 26-28 August, stressing that the "the right to adequate food for all" should be a priority concern in biofuel development, but the two can be achieved simultaneously. In his address, Dr Dar emphasized the need to overcome the food-fuel trade-off by promoting feedstock like sweet sorghum that can grow on marginal lands and hence do not compete with food production. “At ICRISAT, our global pro-poor BioPower initiative focuses on biomass sources and approaches that do not compete with but rather enhance food and nutritional security. Sweet sorghum is one such ‘smart’ multipurpose crop – the grain is used for food while the stalk is used for bioethanol production,” said Dr Dar. “With the threat of an energy crisis looming globally, there is a potentially huge demand for ethanol from sweet sorghum. We believe that this crop provides a wonderful opportunity for dryland farmers to earn more money from the stalks through making ethanol, and at the same time benefit from its gain’s high nutritional value. Also along with its resilience under extreme weather conditions – it is vital to fighting poverty and food and nutritional insecurity,” he continued. Dr Dar’s goal was to bring to the attention of the world the need for better research-for-development, as well as policy and strategy convergence for food security and biofuel development among countries worldwide. “It is encouraging to note that the Western Australian Government, in partnership with Kimberley Agricultural Investments, has plans to grow grain sorghum on 13,400 ha of land to be processed into ethanol,” said Dr Dar. Australia stands 17th in the consumption of renewable energy worldwide, with a bioethanol production capacity of 440 million liters using feedstock like wheat flour, red sorghum and sugarcane; and 350 million liters of biodiesel produced in the last year from tallow, used cooking oil, canola, poppy and vegetable oil. The use of sweet sorghum in existing sugar mills as biofuel feedstock is also providing a win-win situation to both the farmers and the industry, with data from India, the Philippines, China and Brazil indicating that sweet sorghum is an economically viable, socially equitable, environmentally sustainable and resilient crop. Dr Dar also highlighted the importance of integrating smallholder agriculture into national policies, strategies, and research-for-development aimed at boosting investment and sustainable development, particularly on pro-poor biofuel initiatives. Dr Dar speaking at the session ‘Ethics and efficiency in the face of competition for food’. Also seen in the picture are (L-R): Chair of the panel, The Hon Margaret Reid AO, Board of Directors, Crawford Fund and Former President of Australian Senate; Dr Laurent Zessler, United Nations Population Fund (UNFPA) Director and Representative for UNFPA’s Pacific Sub-Regional Office, Fiji; and Mr Yudi Guntara Noor, President, Asian-Australasian Association of Animal Production Societies. In his closing comments, Dr Dar emphasized that food security is paramount over energy security, and that there is a need to balance energy security and food security to mitigate food price volatility. Vital to this is involving women and smallholder farmers in the biofuel value chain, as about 80% of the food consumed in developing countries is produced by smallholder farmers, who ironically comprise 75% of the world’s poorest people, 90% of whom are women. This year’s Crawford Fund annual conference on food security, which holds a key place in the development and food security calendar in Australia, was attended by over 250 participants and had the theme “Ethics, Efficiency and Food Security: Feeding The 9 Billion, Well.” The event focused on a range of vital issues facing the developing world and Australia in efforts to produce more food in an ethical and efficient way.